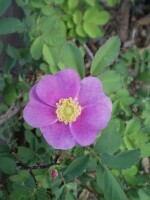 A Woods' Rose in bloom. After several years living in our garden, this native perennial has finally bloomed. This rose has slowly grown and spread each year, but hadn't bloomed until this year. I'm not sure what combination of events brought on the flowers, but here they are. And the Woods' Roses smell great despite their compact size. Step Outside, Spring is Here! 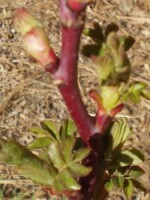 The weather is warming, trees buds are swelling, irises are sprouting and it feels like spring. The Vernal Equinox is nearly here as a late winter storm passes through, and the trend is definitely toward Spring. I often hit a wall in late winter and lose my momentum. Spending time outside is one thing that refreshes and recharges me. Feeling the sun, breeze and nature around me clears my head and helps me move forward again. Going outside to walk, bike, garden, even backcountry ski are my Winter to Spring reset button. Did you feel that? It felt like the earth moved under my feet. Actually, it was a shift in climate, as marked by the 2012 USDA Plant Hardiness Zone Map. The PHZM (Plant Hardiness Zone Map) is the guide gardeners use to decide what plants will likely grow, or not, in our yards. 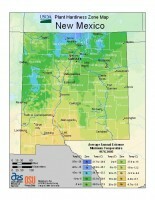 The 2012 version of the PHZM shows that the hardiness zone lines have shifted for most of the U.S. My home has shifted from Hardiness Zone 5b (1990 map) and is now solidly in Hardiness Zone 6b (2012 map) which is 10°F. warmer. The Winter Solstice has passed and short, cold days are here. If you planned ahead, the fruits of Summer and Fall are stored in your pantry. 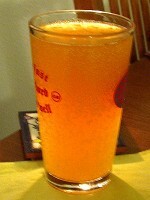 We preserved some Gravenstein apples in a very traditional American way - by making hard cider! After all, there are only so many jars of applesauce, apple butter and dried apples you can use. I Love Winter. Except for one small thing. It is VERY difficult (or VERY expensive) to get fresh and ripe vegetables in the winter. And it is nearly impossible to get LOCAL vegetables (other than root crops) in the winter. That is, not until I built a cold frame. 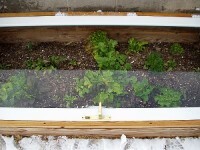 Now we have fresh salad greens (and hopefully carrots and broccoli) grown in our snow-covered backyard. What is Wilderness and Whither Preservation? What is 'Nature' and does 'Pristine Wilderness' still exist on earth? Emma Marris starts with these questions and launches a journey in Rambunctious Garden: Saving Nature in Post-Wild World. Ms. Marris effectively challenges many of the assumptions that inform our views and policies toward nature. I think Rambunctious Garden can spark a conversation about green places and how we use and protect them. There has been so much great produce that I’ve been cooking up a storm. For example, this looks terrible, tastes great Gumbo z’Herbes. 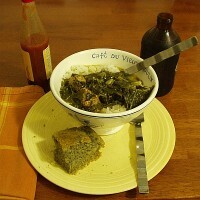 It is apparently a spring tradition to serve this type of gumbo that goes nuts with the greens. It just so happened that half of the refrigerator was occupied by bags of greens: kale, spinach, mixed cooking greens. This recipe took care of them all and more: the Andouille hiding in the freezer, small bundles of scallions and parsley, that cup or so of vegetable broth, and the last few squares of blue cornbread on the side. Have you heard of La Niña? Despite the name, La Niña isn't a person 'she's' a thing - specifically a weather pattern. The important thing to know about La Niña is she tends to bring dry winters to the Southwestern US and that means drought. 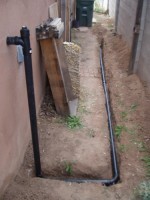 In my efforts to use water more efficiently I've added a grey-water system from our washing machine to irrigate a planting bed. Somewhere in your county, a secret agent stands at the ready. He (or she) is the local County Extension Agent, ready to answer your home garden and landscape questions. County Extension Agents aren't supposed to be a secret but they are lower profile than the 'Double-O' kind of agent. 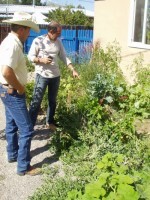 I just met the local Extension Agent and learned quite a lot about the art of growing plants and animals in my county.